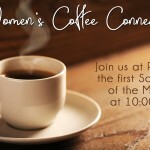 We invite you to join us for this no host coffee time the first Saturday of each month. The Words of Jesus on April 21, 2019. Jesus: The Way, the Truth, and the Life on April 14, 2019. David & Bathsheba on April 7, 2019.